Did Jesus ever marry? This story helps us know the answer. 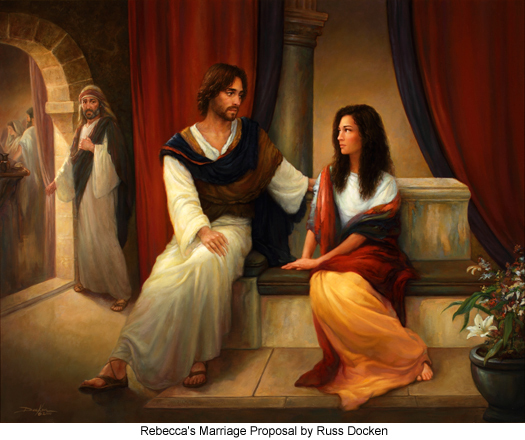 It should not come as a big surprise that Jesus was admired by many woment in his life, and this woman - Rebecca - was the first that we know of who actually pursued Jesus' hand in marriage. For more info about this topic of Jesus and marriage, please see THIS LINK, where it is explored in more detail. 127:5.3 Jesus listened attentively and sympathetically to the recital of these things, first by the father, then by Rebecca herself. He made kindly reply to the effect that no amount of money could take the place of his obligation personally to rear his father's family, to "fulfill the most sacred of all human trusts — loyalty to one's own flesh and blood." Rebecca's father was deeply touched by Jesus' words of family devotion and retired from the conference. His only remark to Mary, his wife, was: "We can't have him for a son; he is too noble for us." 127:5.6 Rebecca was heartbroken. She refused to be comforted and importuned her father to leave Nazareth until he finally consented to move to Sepphoris. In after years, to the many men who sought her hand in marriage, Rebecca had but one answer. She lived for only one purpose — to await the hour when this, to her, the greatest man who ever lived would begin his career as a teacher of living truth. And she followed him devotedly through his eventful years of public labor, being present (unobserved by Jesus) that day when he rode triumphantly into Jerusalem; and she stood "among the other women" by the side of Mary on that fateful and tragic afternoon when the Son of Man hung upon the cross, to her, as well as to countless worlds on high, "the one altogether lovely and the greatest among ten thousand."